CTLE Blog: Are you facing grading hell? Maybe you want to try the stairway method of grading, demonstrated here. 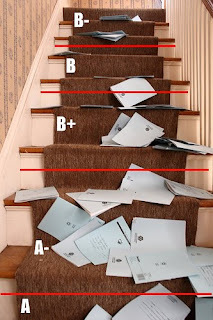 Just throw everything down the stairs, and then determine the grade based on where it lands. According to the creator of this photograph, to stay current with grade inflation the top stair should be a B-, the bottom stair an A. We are rapidly approaching the end of the semester, and many of us are about to receive dozens, or hundreds, of papers, exams, and other assignments, which will need to be graded - and rather quickly. How can you do this efficiently, and without resorting to tactics such as throwing papers down the stairs or shooting exams out of a canon? Probably the most important thing you can do is to ensure that you have a clear set of grading criteria and a rubric that you can use to assign grades. You can learn more about how to do this here - this article also includes a great reference list of other resources on rubrics. Another way to make grading more efficient is to avoid procrastinating - we've all done it, and then spent an entire night frantically trying to finish entering grades before they are due. Make it a pleasurable experience - pick a coffee shop or some other environment you enjoy, get yourself a snack and a comforting beverage, and give yourself a reward when you get done. maybe even throw a grading party, and get together with colleagues so that you can take breaks and refresh yourselves before diving back in. Aim to grade in several shorter sessions instead of one all-nighter - this can help to make sure that you keep your sanity, and that you don't take your frustrations out on your students. For the future, I strongly recommend avoiding a pile of grading before it happens. One way to do this is to spread assignments across the semester. Instead of a midterm and a final, try 4 shorter exams, or even weekly quizzes. Instead of a final paper, try providing topics with staggered deadlines (e.g., Topic 1 papers are due in October, Topic 2 papers in November). This means you have less grading at any one time. In my evaluations, students report liking the flexibility these types of assignments allow, and appreciate that the material is broken down into smaller chunks. Students also seem to respond well to getting feedback earlier than may be typical. This gives students a chance to improve, and an opportunity to discuss the material and ask questions after receiving feedback - something that rarely happens after the end of the semester. What do you do to make the grading process more efficient and less painful? Please share your stories and tips!